TH E M R EP O RT | 61 O R I G I NAT I O N S E R V I C I N G DATA G O V E R N M E N T S E C O N DA R Y M A R K E T THE LATEST LOCAL EDITION LOCAL EDITION DATA Housing Remains a Challenge in Colorado's Growth COLORADO'S STRONG ECONOMY AND JOB MARKET HAVE BEEN AN ATTRACTION FOR MILLENNIALS, BUT YOUNG ADULTS ARE FINDING AFFORDABLE HOUSING IN SHORT SUPPLY. COLORADO // Higher housing costs, lagging construction, and the rise of high-end single-family homes has made affordable housing a big challenge for Colorado, a state that is otherwise outpacing the rest of the nation economically. According to a report from the Wells Fargo Securities Economics Group that outlined the factors in the rapidly accelerating economy of the Centennial State, the state received less of a lift from domes- tic net migration, with the state's popularity slipping among those that chose to move there. It slid from the third largest gainer from domestic migration in 2015 to 11th in the last year, the Wells Fargo report indicated. The slide, the report said, was likely due to the higher hous- ing costs in Denver. Domestic migration accelerated in states with more affordable homes for sale, such as Arizona, Idaho, and Nevada in the West; as well as North Carolina, Georgia, and Tennessee in the South. The Mile High City, "served as a beacon for millennials in particular, as the metro area's 20 to 34-year-old population grew by 83,162 from 2010 to 2016, which was the 10th-largest gain in the nation," the report revealed. However, that growth fueled a boom in the construction of luxury apartments that accounted for most of the price increases the city has witnessed recently. Looking at the future, the report said Denver's attraction for millen- nials could be hampered by these skyrocketing costs in housing. 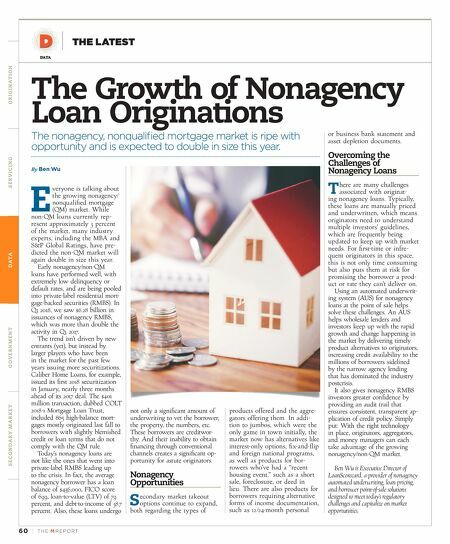 "While job and income growth have also been strong, many younger persons are still strug- gling to save for a down payment, particularly with home prices ris- ing so rapidly," the report stated. "Affordable housing is in extremely short supply. Housing remains an enormous challenge in Denver and much of the Front Range," said Mark Vitner, Senior Economist for Wells Fargo Securities and the author of the report. "Construction has lagged population growth, and much of what has been built has been luxury apartments or high-end single-family homes." Despite the challenges posed by the housing market, Colorado, the report found has the fifth fastest growing job market in the United States and is only behind Utah, Idaho, Nevada, and Texas. "The state has seen an influx of tech companies from California in recent years and is also home to many rapidly growing start-ups. The growth in the tech sector has helped draw in young college graduates, making the state a magnet for millennials," the report indicated. Where Can Homebuyers Find a Bargain in NYC? THE BRONX AND STATEN ISLAND ARE THE TWO MORE AFFORDABLE OF NEW YORK'S FIVE BOROUGHS. NEW YORK // No one doubts that New York city is an expensive place to live. But PropertyShark wanted to know, is there anywhere in the Five Boroughs where you can buy a home for less than $500 per square foot? Turns out, yes. Pickings are slim if you're in Manhattan, Brooklyn, or Queens, but according to PropertyShark, the Bronx and Staten Island offer homes in this price range in every neighborhood. "The 10032-zip code in Harlem is the only location where you can buy for under $500 per square foot in Manhattan," the report stated. "In fact, you'll even have a hard time finding a place at $1,000 per-square-foot in the borough." Likewise, the report found, almost the entire northern part of Queens and most of Brooklyn have prices above $500 per square foot, though the eastern and far south sides of Brooklyn do have homes below that price point. "The most budget-friendly listings in Queens are in 11375, where there are currently 49 properties listed for under $500 per square foot, and 11357, with 32 listed properties below this price," the report stated. Most Queens homes below the $500 price point are on the south- ern side of the borough "Based on our 2018 sales data," the report stated, "one of the most affordable zips in Queens is 11692, with a median price per square foot of $199." However, in most of the neigh- borhoods in the Bronx, the report stated, "you can easily purchase a house with square-foot prices of around $200. Houses in a few zip codes also sold for less this year, including in 10474 and 10459, where the median square foot price is $142 and $185, respectively." According to the report, zip code 10463 has the largest number of listings under $500, with 204 homes under that cutoff. Staten Island has the most budget-friendly listings in the Five Boroughs, PropertyShark reported. Most properties below the $500 price point—232 listings overall—are in zip code 10321. "Square-foot prices in the borough are above $300 in the majority of the neighborhoods," the report concluded. Three zip codes in the northern part of the borough have prices just below, in the high $200s. PROPERTY SERVICES | ACCUMATCH | ALTISOURCE | ARMOR CONCEPTS | ASONS | ASPEN GROVE SOLUTIONS | ASSERO SERVICES | ASSET VALUATION & MARKETING | BANKUNITED | BEERS HOUSING | CAPITAL ONE | CASTLEOAK SECURITIES | CONSOLIDATED CREDIT SOLUTIONS | CONTINENTAL REAL ESTATE SERVICES | EGAN MAE | FEDERAL HOME LOAN BANK OF CHICAGO | FIRST ALLEGIANCE | FIRST AMERICAN | FREDDIE MAC | FUTURA TITLE AND ESCROW | GLOBAL DMS | HEAVNER, HUDSON & MARSHALL | INDEPENDENCE TITLE | JOHNSON, BLUMBERG AND ASSOCIATES | LANDMARK NETWORK | LOANCARE SERVICING | LUADAN PROPERTIES | METROCORP CLAIMS | MLG OF CALIFORNIA | MORTGAGE CONNECT | MSI | NATIONAL TAX SEARCH | NATIONSTAR MORTGAGE | OCWEN FINANCIAL CORPORATION | PENNYMAC | PRECEDENT MANAGEMENT | QUINTAIROS, PRIETO, WOOD & BOYER | RICHARD M. SQUIRE & ASSOCIATES | RUTH RUHL | SERVICELINK | SHD LEGAL LAVINTHAL, & FRANKENBERG | TEN-X | TRULY NOBLE SERVICES | U.S. BANK | VAN NESS LAW FIRM | VRM MORTGAGE SERVICES | ZVN PROPERTIES | A&D PROPERTY ACCUMATCH | ALTISOURCE | ARMOR CONCEPTS | ASONS | ASPEN GROVE SOLUTIONS | ASSERO SERVICES | ASSET VALUATION & MARKETING | BANK OF AMERICA | BANKUNITED HOUSING | CAPITAL ONE | CASTLEOAK SECURITIES | CONSOLIDATED CREDIT SOLUTIONS | CONTINENTAL REAL ESTATE SERVICES | EGAN AND ALAILY | FANNIE MAE | BANK OF CHICAGO | FIRST ALLEGIANCE | FIRST AMERICAN | FREDDIE MAC | FUTURA TITLE AND ESCROW | GLOBAL DMS | HEAVNER, BEYERS & MIHLAR | HUDSON & INDEPENDENCE TITLE | JOHNSON, BLUMBERG AND ASSOCIATES | LANDMARK NETWORK | LOANCARE SERVICING | LUADAN PROPERTIES | MERSCORP HOLDINGS | METROCORP CALIFORNIA | MORTGAGE CONNECT | MSI | NATIONAL TAX SEARCH | NATIONSTAR MORTGAGE | OCWEN FINANCIAL CORPORATION | ORLANS MORAN | PENNYMAC MANAGEMENT | QUINTAIROS, PRIETO, WOOD & BOYER | RICHARD M. SQUIRE & ASSOCIATES | RUTH RUHL | SERVICELINK | SHD LEGAL GROUP | STERN, LAVINTHAL, & FRANKENBERG | TRULY NOBLE SERVICES | U.S. BANK | VAN NESS LAW FIRM | VRM MORTGAGE SERVICES | ZVN PROPERTIES | A&D PROPERTY SERVICES | ACCUMATCH | ALTISOURCE CONCEPTS | ASONS | ASPEN GROVE SOLUTIONS | ASSERO SERVICES | ASSET VALUATION & MARKETING | BANK OF AMERICA | BANKUNITED | BEERS HOUSING | CAPITAL CASTLEOAK SECURITIES | CONSOLIDATED CREDIT SOLUTIONS | CONTINENTAL REAL ESTATE SERVICES | EGAN AND ALAILY | FANNIE MAE | FEDERAL HOME LOAN BANK OF CHICAGO ALLEGIANCE | FIRST AMERICAN | FREDDIE MAC | FUTURA TITLE AND ESCROW | GLOBAL DMS | HEAVNER, BEYERS & MIHLAR | HUDSON & MARSHALL | INDEPENDENCE TITLE BLUMBERG AND ASSOCIATES | LANDMARK NETWORK | LOANCARE SERVICING | LUADAN PROPERTIES | MERSCORP HOLDINGS | METROCORP CLAIMS | MLG OF CALIFORNIA | MSI | NATIONAL TAX SEARCH | NATIONSTAR MORTGAGE | OCWEN FINANCIAL CORPORATION | ORLANS MORAN | PENNYMAC | PRECEDENT MANAGEMENT | QUINTAIROS, WOOD & BOYER | RICHARD M. SQUIRE & ASSOCIATES | RUTH RUHL | SERVICELINK | SHD LEGAL GROUP | STERN, LAVINTHAL, & FRANKENBERG | TEN-X | TRULY NOBLE | U.S. BANK | VAN NESS LAW FIRM | VRM MORTGAGE SERVICES | ZVN PROPERTIES | The American Mortgage Diversity Council (AMDC) was created with one mission to create an industry that is diverse and inclusive of individuals from all backgrounds and allows equal opportunities for minorities, women, disabled, veterans, LGTBQ+, and those diverse in other areas. Join a group of diversity champions from all backgrounds who work together for the betterment of our industry. 2018 MEMBER COMPANIES A&D Property Services | Altisource | Apex Asset Management Group | Arch MI | Armor Concepts | Aspen Grove Solutions | Assero Services | AssetVal | Auction.com | Bank of America | BankUnited | Beers Housing | Black Knight | Caliber Home Loans | Consolidated Credit Solutions | Continental Real Estate Services | CoreLogic | Cyprexx Services | Deval | Doonan, Graves & Longoria | Fannie Mae | Federal Home Loan Bank of Chicago | Federal Home Loan Bank of Dallas | FICO | First Allegiance First American | Five Brothers | Flagstar Bank | Freddie Mac | Folks Hess Kass, PLLC | GLS Legal Services | Heavner, Beyers & Mihlar | Home Depot Renovation Services | Independence Title | JGM Property Group | Landmark Network | Laudan Properties | McMichael Taylor Gray | Mercer Belanger | MetroCorp Claims | MGIC | Mr. Cooper | National General Lender Services | National MI | National REIA | National Tax Search | Ocwen Financial Corporation | PennyMac | Randall S. Miller & Associates | Richard M. Squire & Associates | RUTH RUHL | Strategic Venture Partners | SVN AuctionWorks | Sutherland | Texas Capital Bank | U.S. Bank | WeatherCheck | Wright, FInlay & Zak | ZVN Properties The AMDC invites all companies across the industry to join us. To learn more about the AMDC, contact Derek.Templeton@AMDCouncil.com or 214.525.6757. 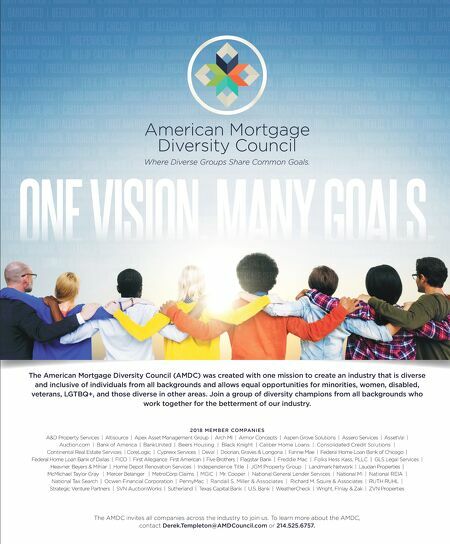 American Mortgage Diversity Council Where Diverse Groups Share Common Goals.